Right now, I’m reading Haruki Murakami’s Norwegian Wood and Fyodor Dostoevsky’s Demons. It’s rare for me to tackle two novels at once, but I figured that the size and density of the latter would be made a little less daunting if I had something else to dip into. 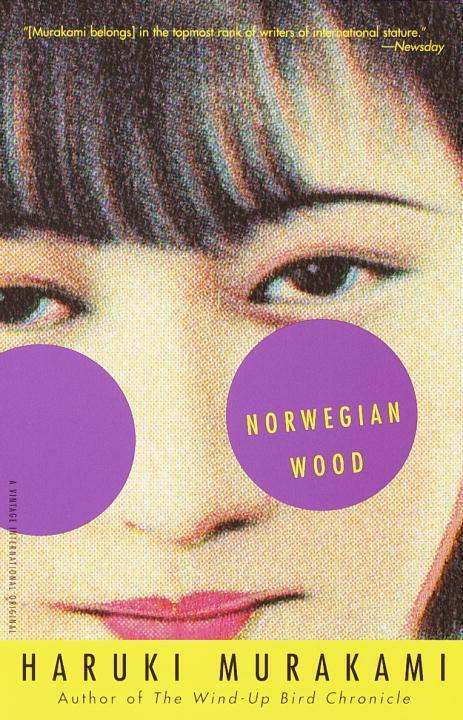 And since I’ve read (and enjoyed) Murakami’s behemoths – 1Q84 and Wind-Up Bird Chronicle – I thought that the much slimmer Norwegian Wood might provide a perfect counterbalance. As I started both books, though, I noticed something. Or, really, I guess it’s just that something I had first noticed a long time ago began to bother me in a way it never had before: the writing in both books sounded strange. It wasn’t constant, but maybe once or twice a page I would come across an idea expressed using language that struck me as odd. Maybe labored is the right word. In any case, it’s become a distraction, and my progress on both books has slowed to a crawl. The thing is, I know why the language sounds strange. Japanese and Russian are (apparently) difficult to translate neatly into English, and so in attempting to convey Murakami’s or Dostoevsky’s ideas, the translators have likely had to make tough choices about maintaining the authors’ literary effectiveness while wrestling languages with enormous systemic differences from English into sentences that make sense to a uni-lingual chump like me. The expression “lost in translation” exists for this exact reason. I know that, in one part of my brain, that is, the part that wants to be fair to these great authors and give them the benefit of the doubt and enjoy the tremendous works they’ve put out into the world. I’ve been able to do this up to now, and I’m glad I have. The Brothers Karamazov is one of my favorite books because of the richness of its characters and the depth of its examination of human nature and relationships, not because of its formal beauty. But there’s another part of my brain that craves the deft execution of a perfect English sentence, which is hard enough to come by in books written by native speakers, let alone in translated works. Even the translations of Spanish language novels I’ve read have come up lacking in prose style in the past (though less so; Latinate languages FTW). This is, I think it bears repeating, nobody’s fault but mine. I don’t think that people writing in other languages are bad writers simply because they aren’t writing in English, and I don’t think that these translators have no style. Theirs is a tremendously challenging task, and it’s amazing to me in the first place that there are people out there who devote so much of their time and energy to bringing these authors and their books to people who would likely never get a chance to read them otherwise. But dammit, I’m a reader. A bookish sort. A nerd, a geek, an obsessive. To quote the Good Doctor Mercury, “I want it all, and I want it now.” It bugs me when something gets between me and a great reading experience, even if that something is simply that I don’t speak Japanese, Russian, Spanish, or even Elvish (although if they made a Rosetta Stone for that one…). And sure, I could remove the frustration by resolving not to read translated works (Lord knows their are plenty of great English language works I miss out on every year. ), but that’s not really a solution, because ultimately it still keeps me from enjoying these books I want to read by keeping me from them altogether. The only real answers are to learn some new languages or else train myself not to focus so much on these little nicks and scuffs in the prose that are distracting me in the first place. I read all sorts of English language books that suffer from these and worse without focusing unduly upon them. Maybe those sentences are just awkward in a more familiar way, and so I can breeze past them. Either way, the onus is on me. It’s my conundrum after all. Here’s to hoping I can figure it out, because the Marquez’s, Murakami’s, and Dostoevsky’s of the world deserve my best effort.